Alan Turing proposed his famous test for artificial intelligence in 1950, proposing that indistinguishability (the inability to detect difference between a computer and a human) could be used to determine artificial intelligence. However, humans make mistakes - so presumably an artificially intelligent computer would also. However, in the context of expert systems, making mistakes is not considered to be useful. In this lecture, I will discuss the relationship between variation in decision making (including how people will sometimes vary in their own decision making), and incorporating variation into computer expert systems. In doing so, I will also cover how variation is needed for learning to take place, before concluding with some thoughts about artificial intelligence and consciousness. Professor Jonathan M. Garibaldi received the B.Sc (Hons) degree in Physics from Bristol University, UK in 1984, and the M.Sc. degree in Intelligent Systems and Ph.D. degree from the University of Plymouth, UK in 1990 and 1997, respectively. He is Head of School of Computer Science at the University of Nottingham, UK, leads the Intelligent Modelling and Analysis (IMA) Research Group, and is Founder of the Advanced Data Analysis Centre (ADAC). His main research interests are modelling uncertainty and variation in human reasoning, particularly in medical domains. He has made many theoretical and practical contributions in fuzzy sets and systems, and in real-world applications. 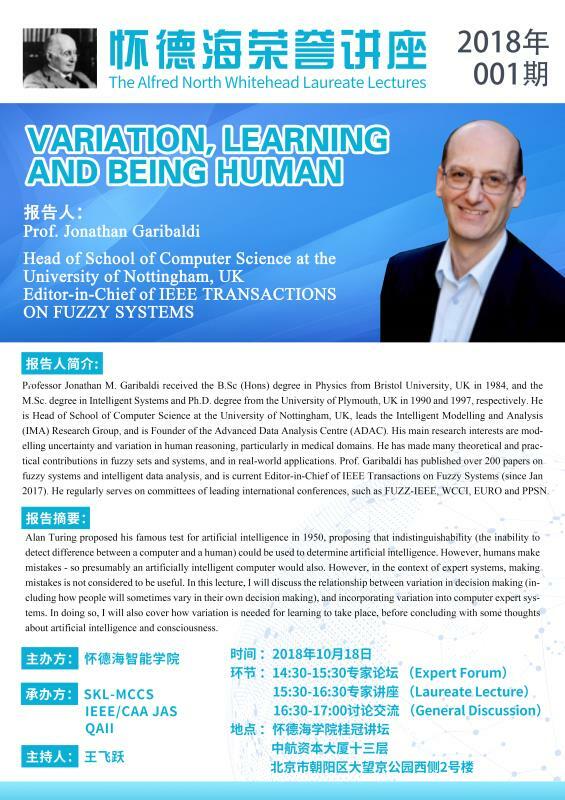 Prof. Garibaldi has published over 200 papers on fuzzy systems and intelligent data analysis, and is current Editor-in-Chief of IEEE Transactions on Fuzzy Systems (since Jan 2017). He regularly serves on committees of leading international conferences, such as FUZZ-IEEE, WCCI, EURO and PPSN.